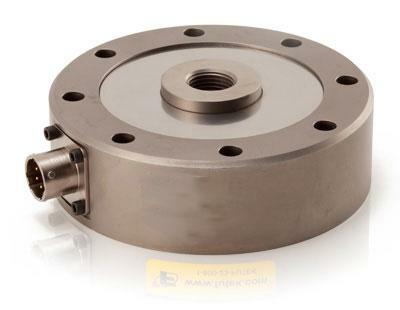 The flat load cells SPIP LCF450 has been designed for test beds, press-fitting applications and control of machinery. This type of load cell is detected automatically by our force and torque gauges CENTOR Star and Dual, and they can complete a set of force/torque measurements at a very reasonable price. The LCF450 is ideal to measure important forces when the working space is limited and is very easy to mount thanks to its 8 through-holes on its perimeter. The sensor characteristics are stored in the memory of the SPIP interface located inside the sensor connector. When the CENTOR Star or Dual is switched on, the information is collected from the central memory and the instrument is automatically configured: it takes into account the type of sensor, its maximum capacity, its calibration data and its overloads without the operator having to make any calibration adjustments. The Centor Touch Star is the most advanced digital force gauge currently available, it has become the benchmark force tester for measurement in research, production and quality. For high capacities, when the measuring space is small or to integrate the force sensor in a system, our digital force gauges Centor Star can be mounted with an external load cell to fit your needs.